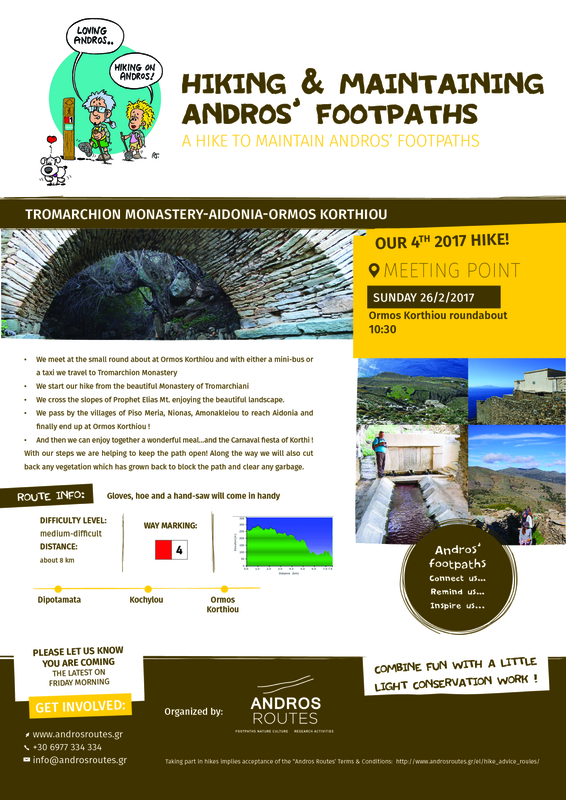 Join us for one more enjoyable hike to maintain the paths of Andros on the route Tromarchion Monastery-Aidonia-Ormos Korthiou ! We cross the slopes of Prophet Elias Mt. enjoying the beautiful landscape. We pass by the villages of Piso Meria, Nionas, Amonakleiou to reach Aidonia and finally end up at Ormos Korthiou ! And then we can enjoy together a wonderful meal…and the Carnaval fiesta of Korthi ! With our steps we are helping to keep the path open! Along the way we will also cut back any vegetation which has grown back to block the path and remove any litter. our 4th 2017 hike ! Please let us know you are coming the latest on Friday morning!